Did you know? The two most common plastics for 3D printing according to MatterHackers are ABS (Acrylonitrile Butadiene Styrene) and PLA (Polylactic Acid). Why is that? They both have their advantages and disadvantages. Let’s see how each stacks up when we compare five different considerations: material properties, printed prototypes, glass transition temperature, biodegradability, and toxicity. ABS is a very sturdy plastic. It is used in things like camera housings, protective casings, and packaging applications. If you need an inexpensive, strong, stiff plastic that holds up well to external impacts, ABS is a good choice. PLA is not known for its material properties. It is more of a consumer plastic than an engineering plastic. Typically, PLA is sought after for its unique ability among plastics to biodegrade in a relatively short amount of time. Among its many uses are food packaging containers and medical implants designed to dissolve in the body over time. This one is tough as there are some advantages to both ABS and PLA for 3D printing. It really depends on who you are and what you’re trying to do with the technology. For DIY print jobs, at-home hobby shops, and/or educational facilities, PLA is a great choice. For engineers or manufacturers looking for high quality professional prototype production, we recommend (and personally use) ABS. PLA for pro-sumers:A pro-sumer is someone who is an amateur in a particular field but who purchases equipment of high quality or with features suitable for professional use. PLA is generally less susceptible to part warping than consumer or pro-sumer ABS machines and can be printed successfully on blue painter’s tape. If it is actively cooled then parts are likely to have a nice sharp finish (less rounded corners without the risk of warping or cracking). PLA is a great choice for hobby shops or small production projects where high levels of detail are desired in the part. The downside to ABS on consumer or even pro-sumer devices is that the surface of the part in contact with the printer baseplate has a tendency to warp. This tendency can be mitigated and in some cases remedied by heating the printer surface and ensuring it is clean. A further downside with do-it-yourself ABS printers is that they have a tendency to produce slightly rounded corners when sharper edges may be desired (such as with gears). This can be remedied by cooling the filament with a fan as it leaves the 3D printer nozzle. Note: be careful not to use too much cooling as that can lead to poor adhesion between layers and may result in product cracks down the road. Fine tuning a consumer quality machine and/or using a higher quality printer will generally fix most issues. ABS for professional shops: Virtually all of the issues with ABS printing on consumer or pro-sumer machines do not apply to most professional shops. The FDM machine at Creative Mechanisms, for example, does not require the kind of fine-tuning that the at-home DIY machines do. Further, although it is not always a final model material, ABS is a production grade material. It is used a lot for form studies for Industrial Designers. Although PLA has some advantages for at-home printing, ABS is a pretty clear choice for professionals and engineers. PLA has a very low glass transition temperature (typically between 111 and 145 °F). This is essentially the temperature that the material begins to soften. Low glass transition temperatures can be a positive or negative thing depending on the circumstances. The benefit was highlighted above in that it can aid in producing sharp edges when actively cooled. The downside is that PLA parts tend to droop if they are exposed to extended periods of warm temperatures (for example, being left inside a car during a warm summer day). Low glass transition temperatures may also pose problems for items that would go in a dishwasher or that are designed to hold hot liquid (e.g. cups) as they may cause the part to deform. ABS has a much higher glass transition temperature (221 °F). It simply does not get that hot in most day-to-day situations, and so ABS parts are much more likely to hold their shape over time. 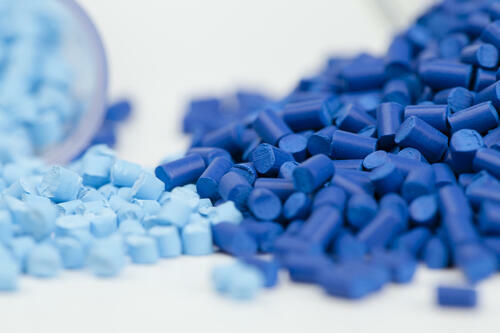 PLA is a bioplastic, meaning that it is derived from renewable plant products like corn and sugarcane. It is an environmentalist’s dream plastic in that it biodegrades in a relatively short period of time when exposed to the elements. For example, PLA that is left in the oceans will typically degrade in a period of 6 to 24 months while petroleum based plastics like ABS can last hundreds of years. ABS, like most plastics, is derived from petroleum. Traditional plastics like ABS last for hundreds of years before they fully decompose. This can be a hugely positive trait, but from the lens of biodegradability it is a negative. Note: Although PLA will biodegrade much faster than petroleum-based plastics, it is not something that will compost successfully in your backyard. It is still a material that lasts a long time when exposed to the elements (just not nearly as long as traditional plastics). There are not any known adverse health impacts from either PLA or ABS. To our knowledge they are both relatively harmless in that they do not contain any known carcinogens. Using an ABS or PLA product is typically fine. Melting, cutting or sanding it might be a different story and should be done in a well ventilated area. For example, we wouldn’t recommend 3D printing parts in a small office space or without proper ventilation installed...particularly ABS as it has a less tolerable smell. PLA, by contrast, emits a slightly sweet odor during printing. Perhaps this should not be surprising in that it is derived from sugarcane! A recent study by researchers at the Illinois Institute of Technology found that substantial nanosized particle emissions can occur from 3D printing. The study examined commercially available 3D printers in an indoor facility using both PLA and ABS feedstock. The major takeaway was to ventilate your office space if you are using 3D printing machinery. This is particularly relevant point for “pro-sumers” (small-scale producer/consumers) that are using the technology for small-scale production in their home or small office. You can read more about the findings from the study here. When you consider the five characteristics we discussed above, there’s not a clear winner in the ABS versus PLA fight. Much of the decision depends on what you are using the plastic for, and the scale at which you need to produce something. To learn more about different types of plastics or the merits of injection molding prototypes, please visit our blog.